The new country house is substantial and stately, yet intimate and warmly inviting. 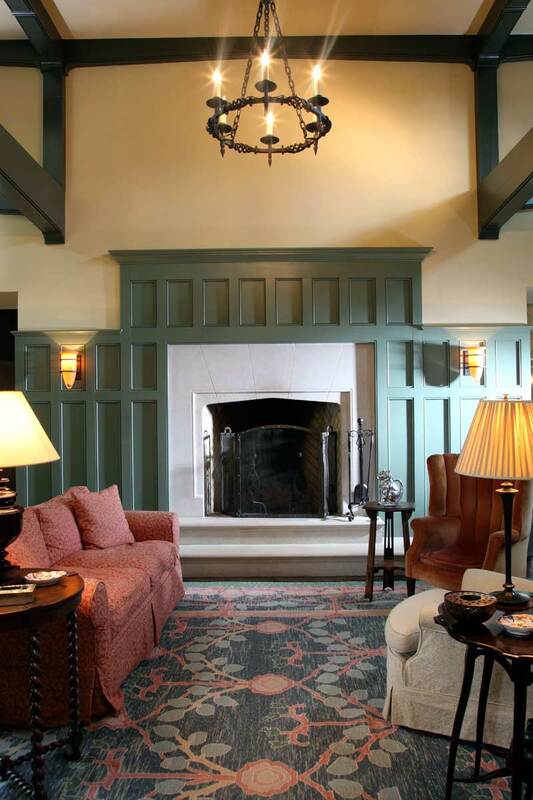 At one end of the beamed great room is a Tudor-style Rumford fireplace with a limestone hearth and surround. Photos by Franklin & Esther Schmidt. In the fall of 1995, Joe Gale and Will Hopkins stood on a knoll in Rappahannock County, Virginia, taking in the panorama from land where they hoped to build a country retreat. The spot was secluded, surrounded by mature trees, and had stunning views of the Blue Ridge Mountains to the west. These were the critical elements in their search for a building site. This was to be the spot. For several years, Gale and Hopkins had been looking, unsuccessfully, for an old house in the Virginia countryside. They had come to the conclusion that it would be best to buy land and then design and build a house to suit their needs. The exterior of the house is inspired by the architecture of C.F.A. Voysey. On a trip to England in the spring of that year, Gale and Hopkins had toured several estates in the English countryside—most of which, according to Hopkins, were so grand that it didn’t seem possible to manage them without a staff of 20. Then they toured Standen, an Arts & Crafts country house with little pretension, the interiors of which were designed by William Morris. “We instantly fell in love with the house,” Gale remembers. Walking the grounds, they joked that, if they ever did build a country house, they would call it “Standen Still” in tribute. 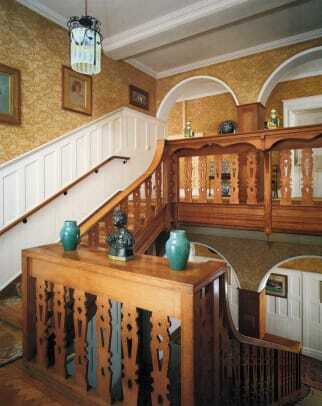 Thus Standen and the English Arts & Crafts style inspired the house they would build. 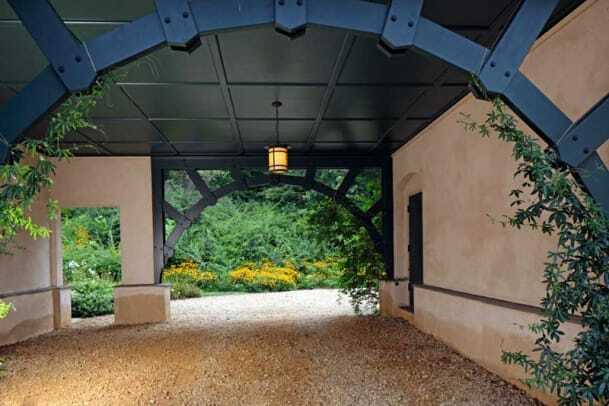 As soon as they had a contract on the land, Gale and Hopkins contacted Michael Holt, the architect who had worked with them during renovation of their city home—a 1909 Arts & Crafts house in Washington, D.C. Holt had updated the house without disturbing its period details, and he was the obvious choice to design the new country house. The dining table and chairs are reissues from Stickley; the sideboard is an antique L. & J.G. Stickley piece. The hand-blocked wallpaper is William Morris’s ‘Arbutus’ pattern. Gale and Hopkins did their research, facilitating a remarkably smooth design process—which itself took about eight months—until the day they moved in. They broke ground in August of 1996, and the house was completed 16 months later. 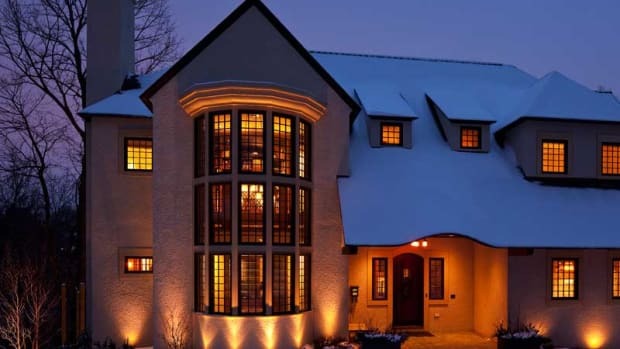 The finished house is stately, yet warmly inviting. 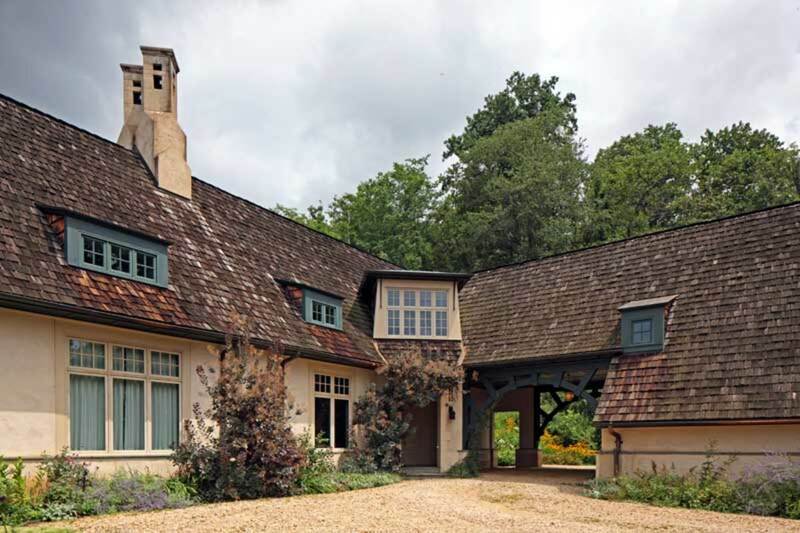 Standen Still has 3,914 square feet of living space (plus 870 square feet unfinished and a 750-square-foot garage). Local contractor Lee Levick built the house; “the only interior designer was William Morris himself,” says Gale. 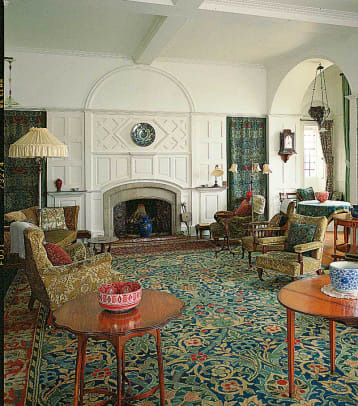 Hopkins affirms that the scale and interior of the house were “very much influenced by Standen.” The two started with a catalog of William Morris fabrics and wallpapers, then narrowed down choices to their favorites. 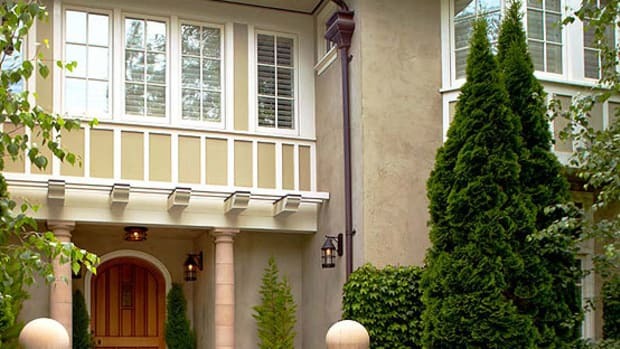 While the exterior of the house channels the English architect C.F.A. 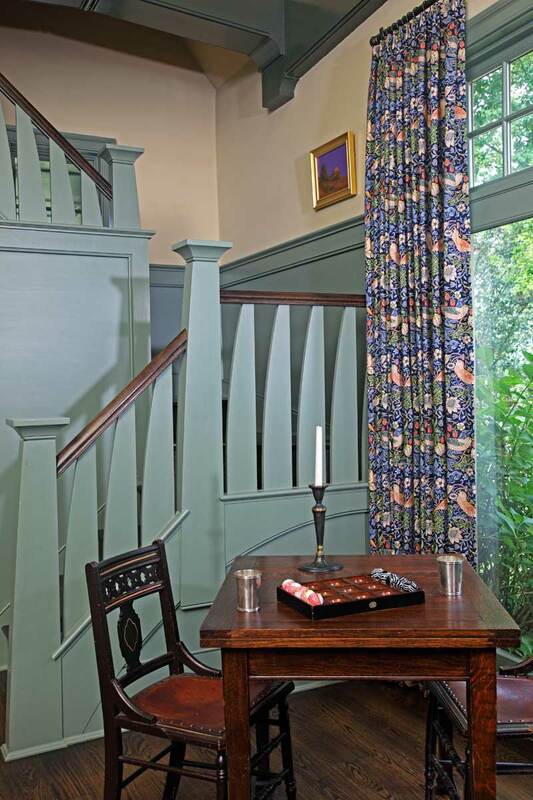 Voysey, its rooms are “pure Standen.” Small nooks for conversation in the great room give the house an intimate feeling, yet there is ample room to entertain a crowd. “We wanted the interiors to be elegant but still comfortable,” Gale says. From the stair hall entry and throughout every room of the house, they achieved exactly that. 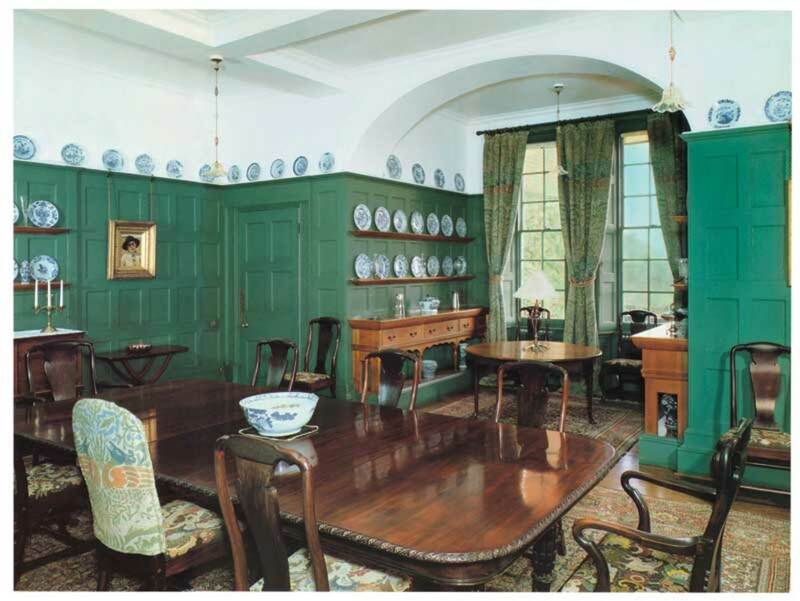 During their 1995 trip to England, Hopkins and Gale bought many furnishings and shipped them back. Gale recalls that “at the time, the dollar/pound exchange rate was favorable—and the English market did not fully value Arts & Crafts as much back in 1995.” He explains that all changed in 1996, when the Victoria and Albert Museum staged a major William Morris exhibition commemorating the hundredth anniversary of his death. Standen is the architect Philip Webb’s “modest country house” built in the 1890s in West Sussex, England, and the inspiration for the new house in Virginia. 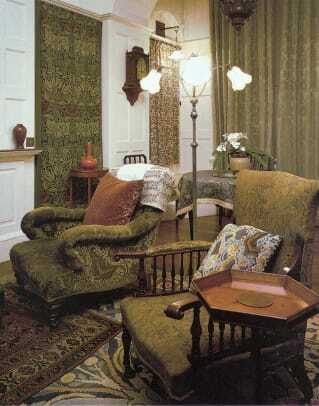 Webb was a lifelong friend and collaborator of William Morris, the father of the British Arts & Crafts movement; the house is decorated with Morris carpets, fabrics, and wallpapers. Rooms inside are remarkably uncluttered for a house of the late Victorian period. 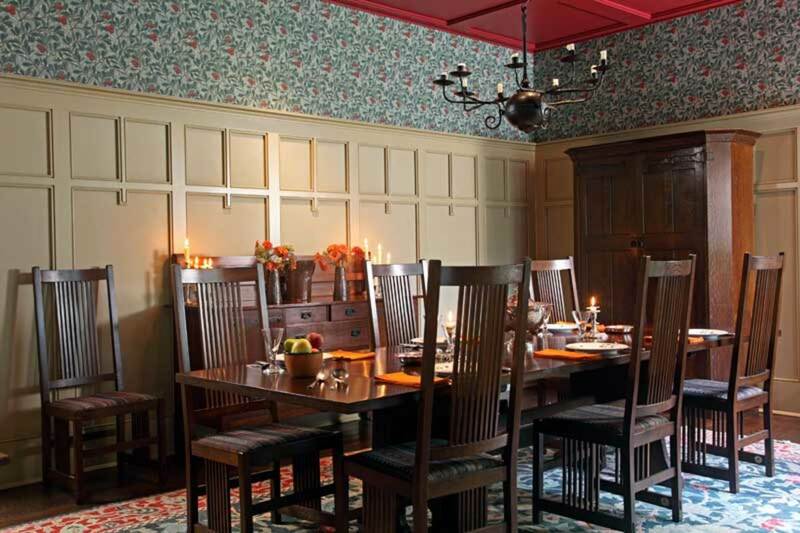 The emphasis is on intimate conversation areas within generous rooms, and of course Morris’s patterns. Standen was built for the solicitor James Beale and his wife, Margaret; the Beale family and Webb were careful about the siting of the house in its rolling landscape. Today both house and gardens are open for public tours. For further information, go to nationaltrust.org.uk/standen. The dining room at the original Standen, the south of England. Handsome and restrained describes a beautifully detailed, brand-new manor on the San Francisco peninsula. 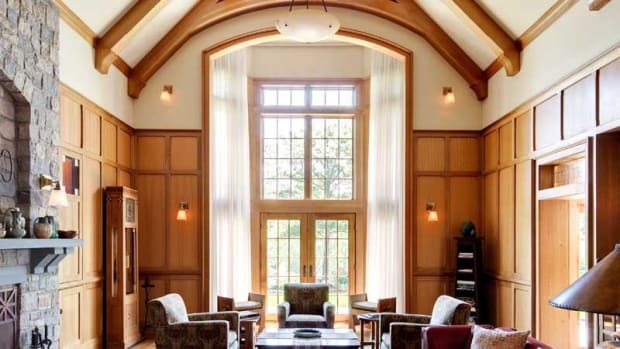 Malick & Associates designed the house with a nod to the groundbreaking and still-fresh work of English Arts & Crafts reformers Philip Webb, C.F.A. Voysey, et al. The past continues to influence today’s interpretive new Arts & Crafts house.